Have you ever wanted to toot a flute? Slide a trombone? Bang on a drum? The New Phil’s Instrument Petting Zoo is your chance! Children of all ages (that includes you too, grown-ups! ), are invited to meet and try the instruments of the orchestra. New Phil musicians guide you on how to hold the instrument and how to make a sound. The Instrument Petting Zoo is a fabulous introduction to all the instrument families! 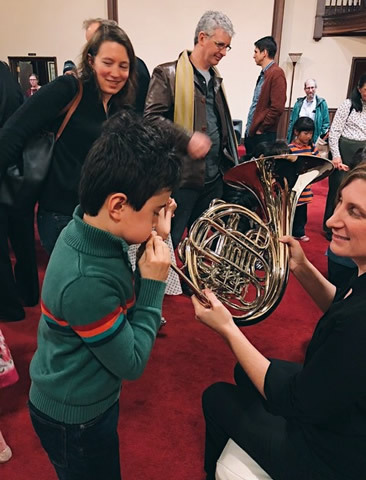 Instrument Petting Zoos accompany each Family Discovery Concert. After watching New Phil musicians and the young guest artists play, your child will be inspired to try the instruments on their own! Discover a budding musician!